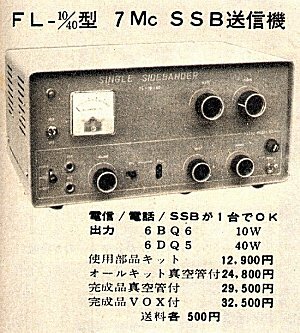 Below is a photo of Yaesu Musen Co's first amateur radio product, the monoband 40 metre 10/40 watt crystal controlled mechanical filter transmitter, model FL-10/40. Covering a frequency range of 7.1 to 7.15 MHz using crystal control and having a built-in power supply, the FL-10/40 was available in two power output versions. 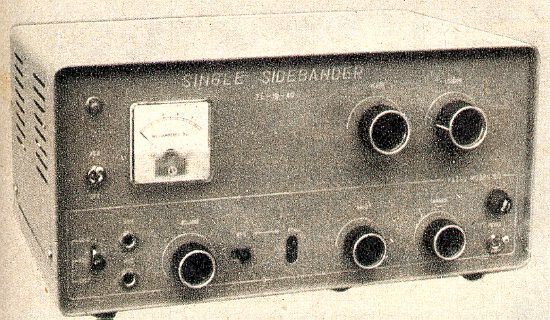 A 10 watt unit used one 6BQ6 tube as its final power amplifier, while a 6DQ5 was used in the 40 watt FL-10/40. VOX transmit control was available as a factory installed optional extra. Size was 300 x 180 x 250 mm and the FL-10/40 was finished in a grey cackle paint. The FL-10/40 shown above is a Mark 1 version which remained in production from 1959 until late 1963. By early 1964 a Mark 2 version of the FL-10/40 was on the market, however it was dropped not long afterwards in favour of the 5 band FL-20 and FL-100 crystal controlled transmitters. 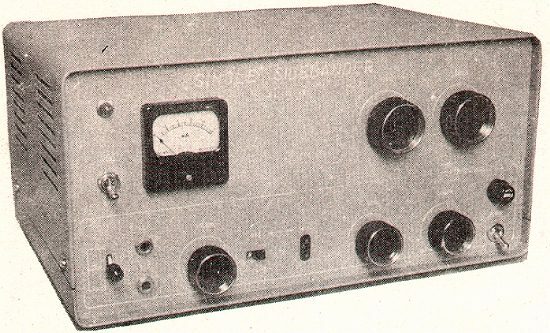 Also helping to push the FL-10/40 out of production was Yaesu's new 5 band VFO controlled transmitter, the FL-100B, which appeared in early 1964. 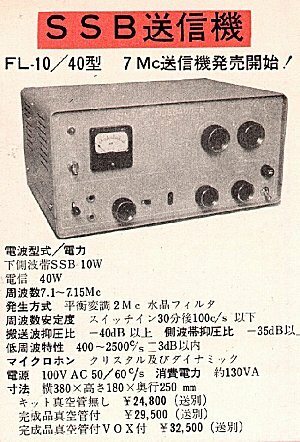 Price of the FL-10/40, 10 watt version, was 24,800 Yen, equivalent to approximately 40 Australian 1964 Pounds. Shown above are two FL-10/40 ads which appeared in Japanese CQ magazine. 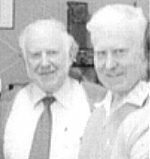 The Mark 1 unit on the left featured in a mid 1963 issue while the Mark 2 unit on the right appeared in an early 1964 copy.